"He cries like a baby when she's mean to him, yet they love each other." 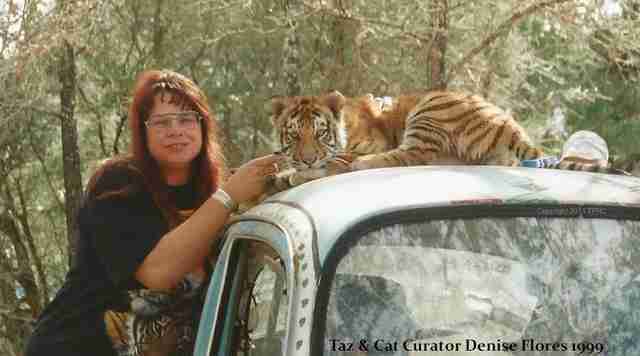 From the moment Taz, a Bengal tiger, was born, he was used as a prop. He was taken from his mother as a cub so that tourists could take pictures with him. 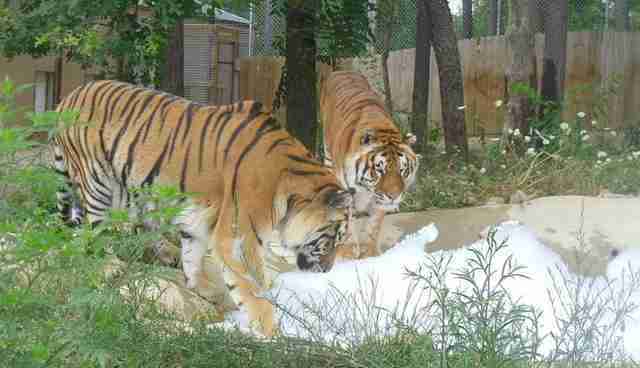 Beginning with his birth in 1998, Taz spent the first part of his life at Noah's Land Wildlife Park in Harwood, Texas. But even before Taz's arrival, Noah's Land was gaining a reputation for its unsavory activities involving animals. Richard Burns, founder and owner of the park, was cited for 14 animal welfare violations in 1995 — and that was just the start of a slew of issues, including a lack of proper veterinary care and food preparation, tiger breeding and selling, and financial problems. "It was a money-making thing for them," Denise Flores, a former park manager at Noah's Land, told The Dodo. "I didn't know any better. I started out not knowing very much about that kind of business." Enamored with the idea of mothering young tigers, Flores knew she wanted to work at Noah's Land. "The first time I was ever there, it was my birthday," she said. "I went into the gift shop and I kept hearing sounds from a back room. There were little screaming sounds. The gift shop lady told me they were baby tigers. And I said, 'Baby tigers? Why aren't they with their mother?'" 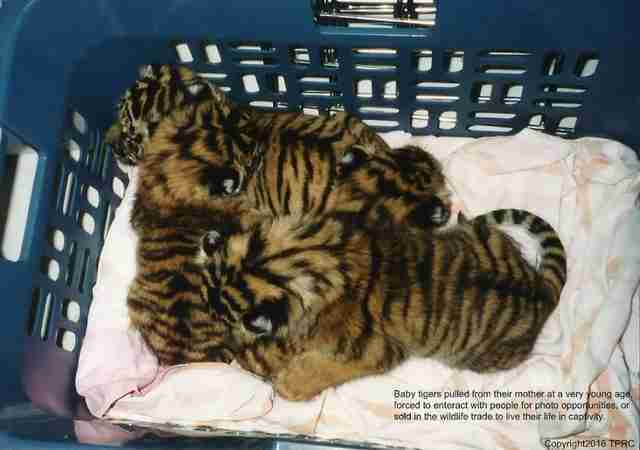 According to Flores, the park's tigers were taken from their mothers when they were around 5 days old. Then, the cubs were bottle-fed by humans and made to participate in photo ops with park visitors. Flores had been at Noah's Land for about a year before Taz was born — and then she became his bottle-feeding caretaker, almost a surrogate mother in the face of Taz's separation from his actual parent. Eventually, Noah's Land went out of business and the owners decided to put everything — including all the animals — up for auction. Flores became deeply concerned for the three young tigers she had raised and become attached to — including Taz. On auction day, Flores acted as a tour guide to people interested in buying the park's animals. "There was hundreds of people there," she said. "It was crazy. I'd never seen anything like it before in my life." While showing a group around the park's premises, Flores expressed her worries about selling Taz and the others to a woman who was interested in buying the park property. "You just don't know what people are going to do with the animals once they get them," Flores told the woman, who then asked for the names of Flores' tigers before the conversation trailed off. Little did Flores realize, the woman went to the individual auction of every tiger Flores had named and purchased them. At the end of the day, the woman found Flores, and said, "I've been looking all over for you, I've got something for you." The woman then handed the proof of purchase for Taz and the other two tigers to Flores — and they were in Flores' name. "I just got three tigers and I was like, 'Where am I going to take them?'" Flores recalled. Luckily, Cheryl Morgan, a different woman who ultimately bought Noah's Land, asked Flores, along with her husband, if they wanted to stay at the park and work for her, granting Flores permission to keep her newly acquired tigers at the park. With nowhere else to take the animals, Flores agreed. In 1999, Morgan partnered with Wayne's World Safari in Mathis, Texas, and had all the animals in the park transferred there from Noah's Land, which closed its doors for good. It was there that Taz and Flores met Ticha. 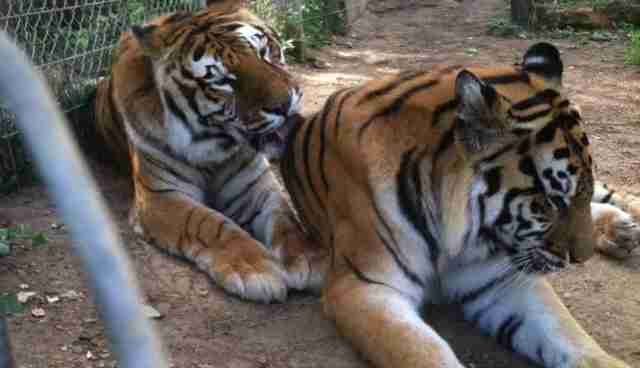 "We got a call from a vet's office over there and he said he had two baby tigers who had come in," Flores said. "They had been attacked by a Rottweiler. Whoever their owners were had a dog. You could buy a baby tiger so easily back then for a few hundred dollars." The veterinarian refused to let the two cubs, who were taken from their mother as infants to be made into house pets, return to the home where they had been hurt — so he asked if Morgan and Flores wanted to keep them instead. 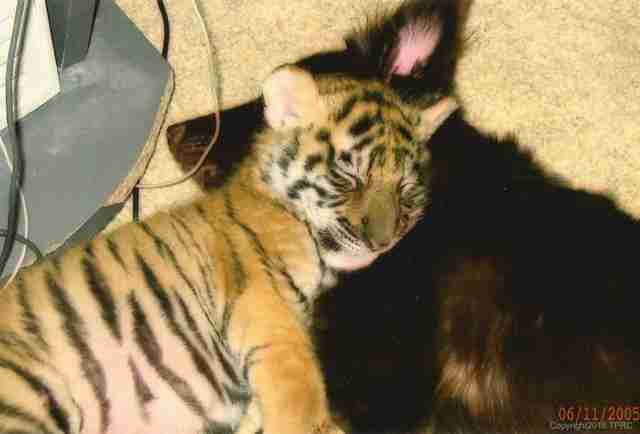 Morgan kept one cub and Flores ended up with Ticha, a female Siberian tiger. The veterinarian told Flores that because of Ticha's injuries from the dog attack, she would never be able to have babies — which was fine with Flores, since she had no interest in getting into the breeding business. She placed Ticha with Taz in the same enclosure and the two cubs clicked instantly. When Flores and her husband retired from the wildlife park business, they made the decision to move to Ohio, where Flores initially hails from — and they took their tigers with them. The thought of leaving them behind was inconceivable. "We dedicated our lives to them," Flores said. "We promised to keep them safe." Shortly after moving to Ohio, Flores and her husband decided to open their own big cat rescue facility in Ashland. "We called it Tiger Paws Exotic Rescue Center and it was all funded by our own money," Flores said. 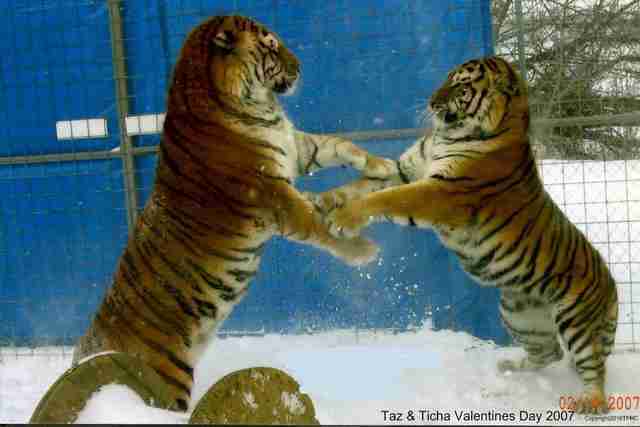 Just before Taz and Ticha made the move to the new facility in 2005, the two tigers gave their owners the biggest surprise: four baby cubs. "We didn't know Ticha was pregnant. It didn't even look like she was pregnant," Flores said. "I was like, 'Are you kidding me?'" As it turned out, the veterinarian's original diagnosis about Ticha's infertility was incorrect. But three of Ticha's cubs died shortly after their birth. Only one female survived, named Katie. 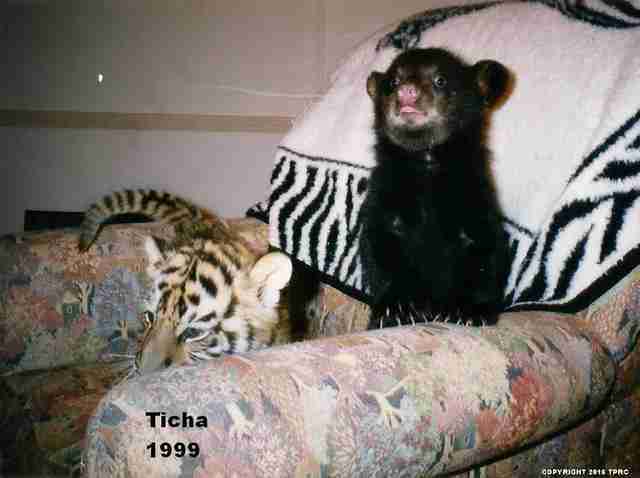 The day after the birth of Ticha's cubs, Taz was neutered to prevent any more surprise babies. 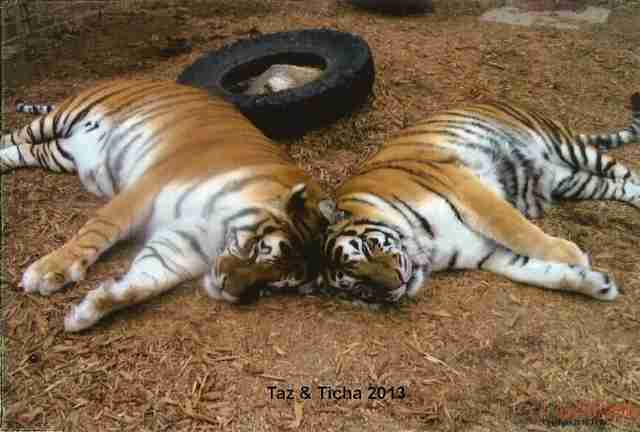 Taz, Ticha and Katie all lived happily at Tiger Paws for years. 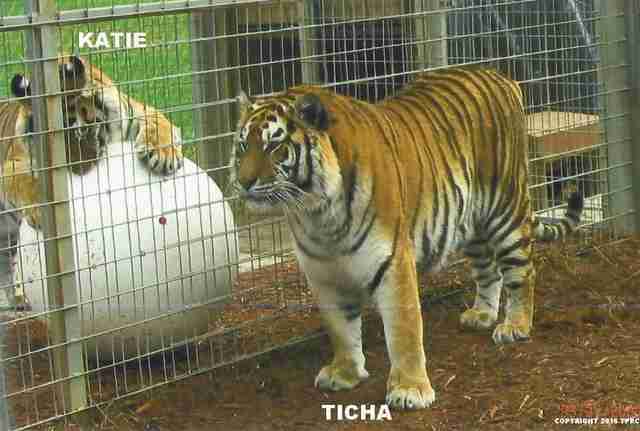 Although Flores described Ticha as not particularly motherly, her affection for Taz was clear — even though she displayed it by bullying and bossing around the bigger tiger. "He cries like a baby when she's mean to him, yet they love each other," Flores said. "We were very successful and the cats were happy and well cared for, up until the Zanesville, Ohio, incident," Flores said. 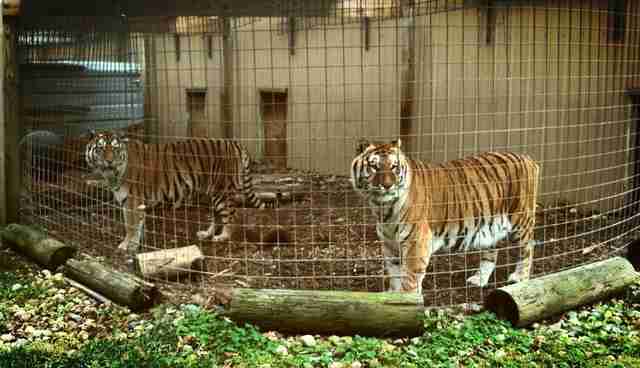 Back in 2011, a man in Zanesville, Ohio, released dozens of wild animals from his private zoo before committing suicide. Police had no choice but to kill 50 of the animals who were roaming freely — including lions, tigers and bears — as they reportedly displayed aggressive behavior. In order to prevent another incident like the one in Zanesville — one that would threaten the lives of not only endangered animals, but humans as well — the Ohio Dangerous Wild Animal Act was passed the following year, calling for stricter regulation of the ownership of wild animals. From there, it was a race for owners of exotic animals to either comply with the new regulations or give up their animals to state officials. The Floreses did not have the means or finances to abide by the new laws, so they had to make the ultimate decision — to let their tigers go. The couple worked with various organizations to place Tiger Paws' rescued animals in the best sanctuaries possible. One such place was Wildcat Sanctuary in Minnesota, which took in Nikita, a white tiger. Katie went to a sanctuary in Oregon, while her parents ultimately ended up at Black Pine Animal Sanctuary in Albion, Indiana. Taz is now around 18 years old, while Ticha is 17. The two spend their days at Black Pine lazing about their large enclosure and cuddling — content to spend the rest of their lives together in comfort despite their tumultuous pasts. Flores still regularly visits them and is happy to see them flourishing in their permanent home. "I wanted those cats to have the best," Flores said. "They went from good to the best ... They did not ask to be born into captivity, so we must give them the best life that they can possibly have, with the respect and dignity they deserve." Want to help Black Pine continue doing good work for animals in need? See how you can contribute here.